The President of Burundi Commends the Role of the Muslim World League in Promoting Peace and Coexistence Among Peoples. Dr. Alissa: The Clash of Civilizations is an Inevitable Result of the Absence of Conscious Logic. 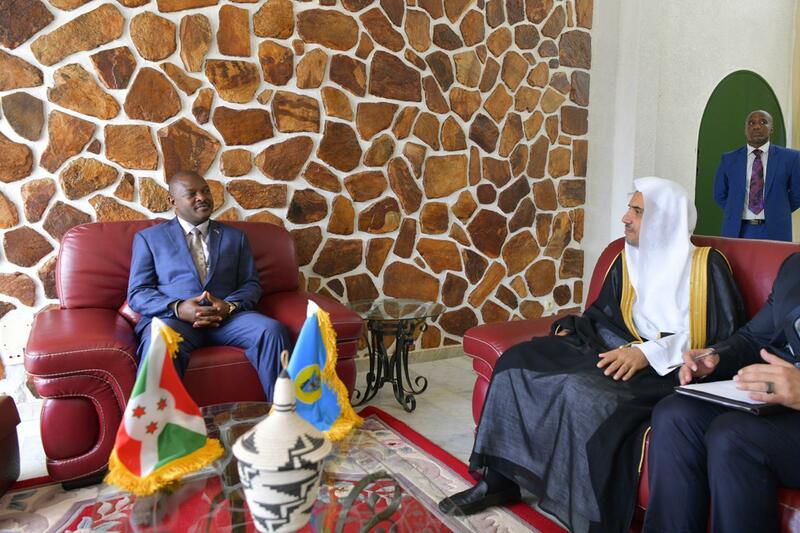 The President of the Republic of Burundi, HE Pierre Nkurunziza, received the Secretary-General of the Muslim World League Sheikh Dr. Mohammad Bin Abdulkarim Alissa and his accompanying delegation at the presidential palace in the city of Kayanza. At the beginning of the reception, the President of Burundi welcomed His Excellency the Secretary General of the Muslim World League, appreciating the role of the Rabita in promoting peace, harmony and coexistence among peoples and countries of the world, through its convening of the International Forum "Religious and Ethnic Pluralism and Positive Coexistence" in Burundi. His Excellency looks forward that this Forum will bear fruitful results in the whole of Africa, where a number of scholars, thinkers and politicians from across the African continent attended and participated in this event. For his part, the Secretary General of the Muslim World League expressed his thanks and appreciation to President Pierre Nkurunziza for the reception and the hospitality and grace extended to the Muslim World League’s delegation, to HE Mr. Presidents patronage of the International Forum, which selected Burundi to be the country welcoming and sponsoring its activities. The Republic of Burundi is characterized by the national integration of its religious and ethnic pluralism, underlining that the clash of civilizations is an inevitable result of the absence of conscious logic. Muslim World League is keen to establish the concept of positive coexistence between different religions and ethnicities. Thus, the MWL is working to raise awareness of the Almighty Creator design in creating differences, diversity and pluralism and call for constructive communication among all. Once entente is established, facts are revealed in an atmosphere of fraternal dialogue full of trust and mutual love. On the other hand, in the course of the visit, the Secretary General of the Muslim World League met with the First Vice-President of the Republic of Burundi, His Excellency Mr. Gaston Sindimwo, the Ombudsman His Excellency Mr. Edouard Nduwimana, and the Speaker of Parliament Mr. Pascal Nyabenda, a number of parliamentarians, and the Minister of Hydraulic Mr. Mr. Come Manirakiza. During these meetings, issues of common interest were discussed.